Pounamu is the Maori name for greenstone or jade. It is found in abundance along the West Coast, both in the rivers and on the coast. Pounamu is highly prized by the Maori, both for its strength and beauty. 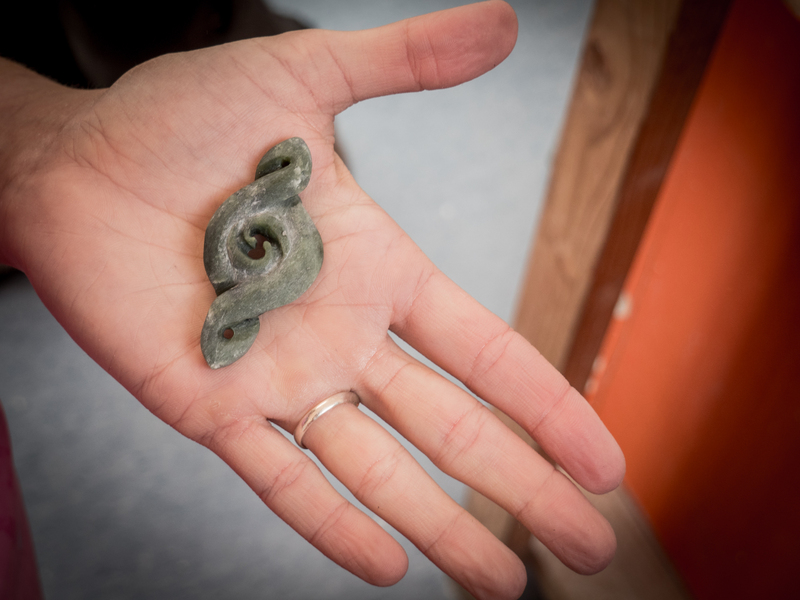 Control over Pounamu in its natural state has been vested to the Maori tribe Ngāi Tahu. There are strict limitations on where Pounamu may be taken from. 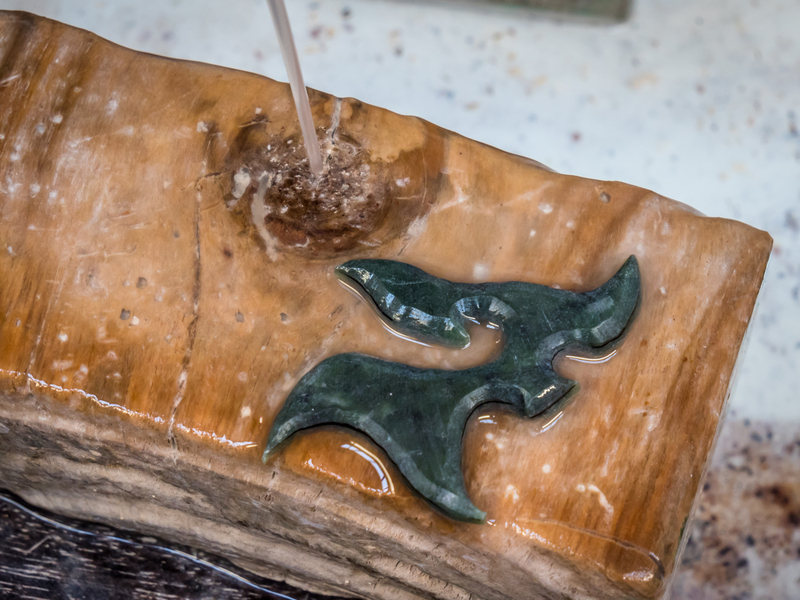 A symbol of status, Pounamu still holds sacred meaning to the Maori. Legend has it that Poutini, a water spirit, stole Waitaiki, a beautiful Maori woman from her home in the North Island. Her Husband, Tamaahua gave chase, perusing them south. Afraid of capture, Poutini transformed her into Pounamu and placed her gently in the cold waters of the Arahura River, himself fleeing out to sea. Pounamu is very hard and was originally used by the Maori for tools such as adzes, chisels and knives. It was also made into Jewellery and was a symbol of the owner’s status and power. Today, a large market caters for tourists that pass through on the coastal road. Hokitika is known as the central place for jade and its few streets are bursting with various shops purveying fine examples of carving. 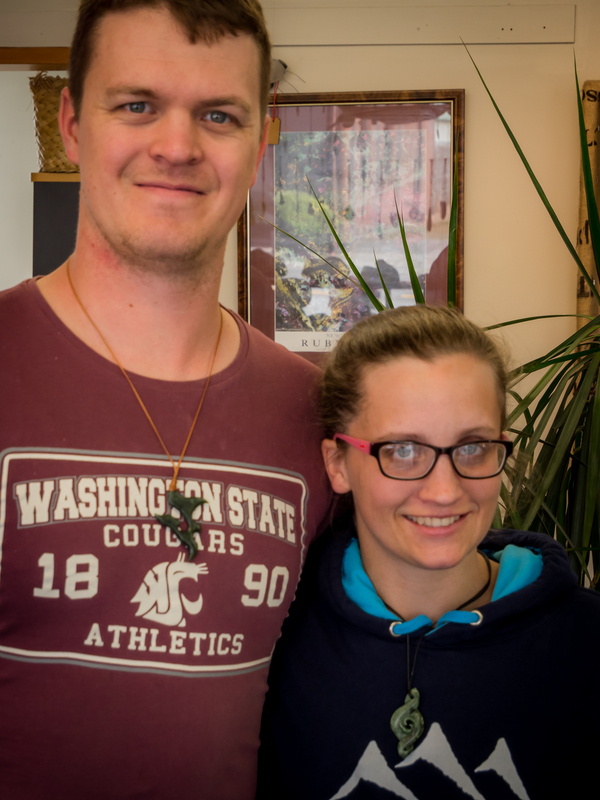 Jade pendants and other jewellery is a popular purchase of many backpackers. One step up from this is making your own to take away with you. There are many shops catering to this niche in a number of towns up and down the west coast. We stumbled upon Bonz ‘n Stonz after it was recommended by Steven, our tutor from the knife making back in Barrytown. The experience itself is expensive at a $180 a go. However considering the pendants available to buy are also in this region, the cost doesn’t seem so bad. Other shops will market their carving experiences at significantly cheaper prices, but beware of the timescale they are offering. At Bonz ‘n Stonz this price was for as long as it took (roughly five hours) whilst other places limit customers to an hour, or even just half! Steve and his master carvers are on hand to guide you through the process, and are friendly and informative. You begin by sketching out your design – and there are numerous scrapbooks of past ideas to help you in the decision making process. Once drawn and cut out, you select a suitable piece of jade which is then cut roughly to shape. After this you get to work carving using a variety of tools – from grinding wheels to high powered dremels. Once complete, numerous amount of sanding with different grades is required, before a final buff and dip in an oil bath completes your hand made piece. In Maori tradition the triple twist represents New shoots growing together, and then joining of two people for eternity. Circles represent the circle of life and the belief that it has no beginning or end. My design symbolises the relationship of God in our marriage, with three twists depicting the trinity and the two waves in the middle circle our marriage. You can also see a likeness to the treble clef within the swirls. Hei Matau symbolises strength and determination. It is believed to bring good health, peace and prosperity, in addition to bringing safe passage over water. It is an important symbol in Maori mythology, as New Zealand is thought to have been fished out of the sea by Maui. Ian’s design merges a cross with the traditional, highly stylised shape of Hei Matau (fish hook). It also makes witness to Matthew 4:19 in which Jesus said “follow me, and I will make you fishers of men”. Another favourite pastime in this area is hunting for Pounamu. Note that as a tourist you are only able to do this on the beaches – it is illegal anywhere else. The beach in Hokitika provides a long length of stone strewn sand which one can pleasantly wander down. Be aware though – many stones have a green hue to them, most of which are not jade! If you do find jade, many of the carving shops will let you process your own. The master carvers are able to identify whether or not your findings are indeed jade, and may also be able to classify it further – although unless you are going to carve with them this service often comes with a fee! Sweet Alice’s: We paid this a visit after reading about the legendary fudge sold here, and we were not disappointed. Sold at a rather reasonable price per 100g, or available for a reduced rate when buying four slices in a box. Sock Museum: A rather random collection of old knitting machines displayed inside a shop selling socks and other woolen items. An informative, if a little out dated, video is on repeat which shows how the machines work. Hokitika Museum: This sounded interesting but it was closed for earthquake remedial work. The National Kiwi Centre: This seemed a bit pricey for what it was offering and we spent some of the money more wisely buying the aforementioned fudge! If you were desperate to see a kiwi though, I suppose here would be as good as any of the kiwi houses up and down the country.